Why do I tri? Because over the last 5 years I have learned that I am capable of anything. So... Why NOT tri? I did my first 1/2 marathon in 2012 when I was convinced by a friend that it was a good idea. I didn't run, but I started and I hated it. Every training run I grumbled. I kept waiting for that day when I would love running, but I just couldn't get there. On race day when I crossed that finish line, I was so beside myself that I was capable of taking on something that I never thought I could do, and finish it. I realized that it was the challenge of pushing myself that I loved. I no longer hated running. I didn't love it, but it was part of the challenge and accomplishment. In 2014 I took a chance and entered the drawing for the New York City Marathon. Go big or go home, right? I was drawn and I questioned myself if I was capable. I ran and ran and ran and on Nov 2nd completed my first (and only) full marathon. What next? One day while hiking with a couple of friends I was told of a group called the Tucson Tri Girls. It was suggested to me to try a triathlon. I told them they were crazy. I can't ride a bike. Never rode one as a kid and I'm absolutely terrified to start now. The obvious solution? Sign up for a Tri. I joined the TTG and Friends Facebook page and was a lurker for a while. I eventually started asking some questions and was told to come to a beginning bike skills class with Coach Robin and Coach Fred. I didn't know a single person there. While everyone else was riding around with their clip in pedals weaving in and out of the cones while waving their hands all around over their heads, I was just trying to stay on top of my mountain bike instead of under it. After the clinic, when I was loading up my bike to go home, someone came up to me and asked me to go to breakfast. It was Gloria Vasquez, Kay Wolferstetter and Kate Lemke. My first thought was to decline because they knew each other and I would just be sitting quietly by myself while they talked, right? I could not have been more wrong! These were the kindest ladies that made me feel so welcome! We talked about everything and they answered all my questions about my upcoming first triathlon and encouraged me to attend a TTG meeting. When I went to a meeting there was a WHOLE ROOM of these amazing women! One room full of a combination of runners, cyclists, swimmers and triathletes all different ages, all different experience levels, all willing to help a newbie. I knew I had found a new family. I bought a road bike and I think I rode it all of 3 times, terrified and only what I absolutely needed to get through this triathlon. I finished my first triathlon with my sister (also her first) and we were last in, but I didn't care about that. What I really cared about was that I rode a bike for 14 miles and I didn't crash and I didn't die. I had to stop 5 times to shake out my numb hands, catch my breath, get a drink, walk up that hill or just regain my composure, but I didn't die! But I didn't feel any more comfortable on bike either. I had many offers from many amazing Tri Girls to come ride with them and "We'll go slow", "We'll just ride on the bike path" and "We'll ride at your pace." I answered every offer with a smile and a "Great! Thanks! I'll let you know!" Knowing I would not go through with it. I was too embarrassed about my bike skills, control and speed to ride with anyone. I didn't want to slow anyone down. I figured I would just ride alone until I got a little better and then try riding with people. After a few months I realized riding alone wasn't working because I wouldn't go out and ride. I needed people. Carolyn Audilet suggested I come ride with her. Um...Ya. Knowing what kind of a cyclist she was and what kind of rider I was, this was NOT a match. So I found excuses why I couldn't ride with her. And then it happened. One day when I cancelled on Carolyn (Aug 2016) she had me meet her for coffee. She told me I was letting my fears get in my way and I needed to face them. She made me promise to meet her to ride. So I very hesitantly rode with her and she was AMAZING! She taught me so much I can't even list it all but the biggest and most important was that she helped me find my confidence. Once that happened I was able to venture out with other people as well. The more I rode and the more people I rode with, the more I learned and my confidence would build. I was starting to actually have fun and enjoy my bike instead of being scared of it. 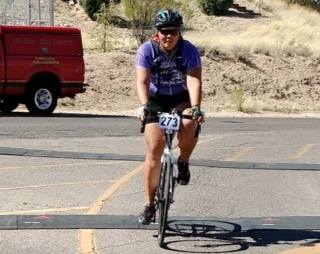 I signed up for my first El Tour de Tucson and rode the 54 mile. Something I never thought I could do. One more challenge completed. In the last year I have completed my first ETT, successfully completed Saguaro East Loop without dying, completed the 51 mile Nogales Classic, climbed Mt Lemmon, descended Mt Lemmon, rode to the Whipple Observatory Visitors Center and learned to NOT ride my brakes on the downhill and much more. Still working on reaching down for my water bottle. My goal for this year is to complete the full 106 mile El Tour de Tucson, which will be my first century ride. Also something I never thought possible. When I started riding, all I wanted was to be able to ride 25 miles without feeling like I wanted to die. I think I have officially passed that accomplishment. None of this would have been possible without Tucson Tri Girls. Individually, so many strong and amazing women. Together, one powerhouse of a family. If I have one piece of advice for any newcomers to the club, it would be don't do it alone. You don't have to. You'll go so much farther with friends, its definitely more fun and so much help is offered here. Welcome to the club! I stumbled upon TTG about 2.5 years ago when I was looking to join a running group. I attended my first meeting feeling like a scared, lonely puppy, because I did not know anyone in the group. I was greeted by Kay Wolferstetter, who literally welcomed me with open arms and declared I had found my family - my aunts and my sisters. I will never forget her warm, welcoming words. Lisa Roberts spoke at the first meeting I attended. I remember thinking how cool it was to have a professional triathlete speak at the meeting, even though I didn’t really know anything about triathlons. I had completed one tri in grad school; the idea came when a friend of mine texted me on a random Wednesday afternoon asking how my swimming was coming along. My swimming?! What swimming? People actually swim for fun? He told me that there was a triathlon coming up at the school and I should sign up. Somehow the seed he planted on many occasions finally sprouted; I bought a bike and he patiently taught me a few things about swimming – like how to put my head in the water (Scary! Good thing I bought those goggles on sale at Kohl’s) and that a one-piece swimsuit was necessary. I signed up for the triathlon. The tri was very beginner friendly and not USAT sanctioned. I showed up on race day with a few supporters and a Victoria Secret bag full of running clothes (what are bike shorts?) and saw people in skin tight onesies (tri suits; who knew those existed?). The only onesie I owned were my footy pajamas. Somehow I survived the pool swim, rode my bike with my cage pedals and finally made it to my safe place, my running shoes. I didn’t really think much about doing another triathlon after that, until I stumbled upon TTG. Let’s get something straight: the women at the TTG meetings were CRAZY. They talked about completing sprint to full distance Ironman races, some even multiple Ironman races. They had an assortment of personalities, careers and stories, but they all had a couple of things in common: they were determined, supportive, ambitious, and they were all older than me! I kept thinking, how do they do it? Who would ever want to do anything besides run, for fun? Well, it seems, if you hang around crazy long enough, you will become it. New Year’s Eve came around and I made it my resolution to complete a full distance Ironman event within three years. My next step was to sign up for tri camp. I couldn’t sleep the night before because I knew we were going on a group ride, and I had never ridden with others, nor had I ever ascended or descended a hill; what’s Gates Pass? Somehow I survived camp and even learned there were RULES in triathlon, such as staying a few bike distances apart from the person ahead of you. This blew my mind; I printed off all the rules and read them thoroughly before my first race. I will start by asking a few few questions. How many of you grew up in an environment where you had a reliable and enormous abundance of supporters to push you to perform at your best potential? How many of you had people in your lives that created opportunities for you to test your fullest and deepest strengths, abilities, and skills? 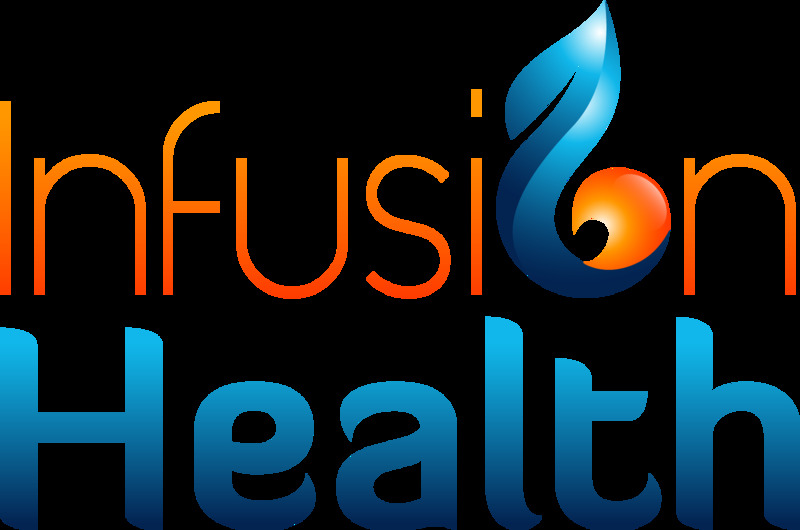 How many of you had genuine, loving, and compassionate adults in your life that were mindful of creating positive growth experiences in preparation opportunities for adulthood? Contemplate those questions for a moment and then realize this, and so much more, is what TTG does for Women in Triathlon and beyond. That being said, when I attended my first meeting with the TTG back in June of 2014 I felt totally out of sorts and ill-equipped to be among this group of very skilled and knowledgeable triathletes. I was pretty nervous and shy being such a novice to the sport. I had tried one triathlon many years prior with a friend who convinced me to sign up for a Tempe Town Lake Sprint Triathlon back in 2000 or so. All I remembered from that experience is that I though I would drown in that disgusting lake and nobody would ever find my body. I had only trained in a pool up until that time and had no idea how difficult it would be swimming in choppy water with so many other people encircled around me in what felt like bubbling vegetable soup. I think I drank half the lake and had serious abdominal issues for 2 months following this event. 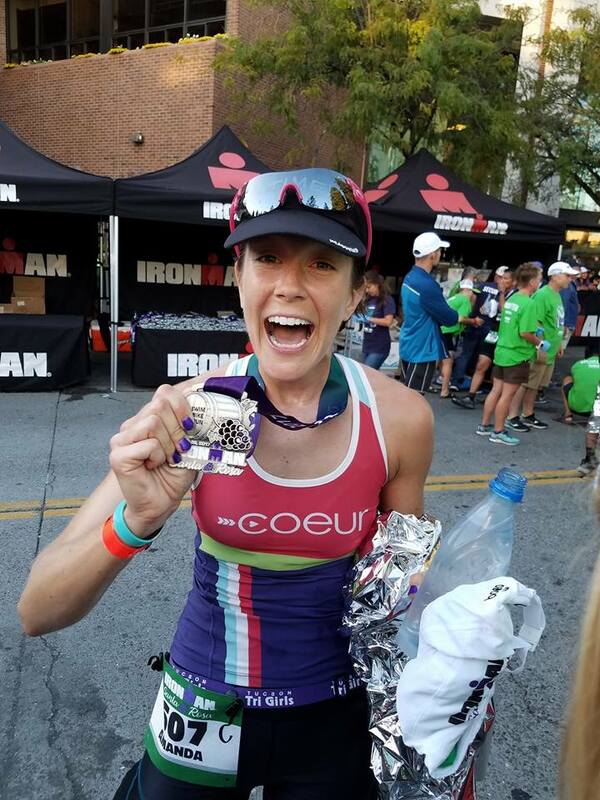 Needless to say I never embarked on or even thought about trying to do another triathlon until I met my now husband while he was training for and then completed the Brazil Ironman back in 2011. I started swimming, biking, and running with Rob as our relationship blossomed to help support him in this endeavor. 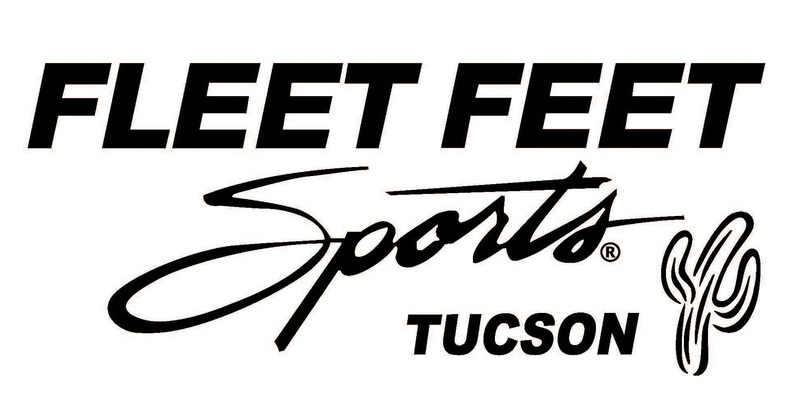 I had always been an avid road and mountain biker and ran “A LOT” with the Tucson Women’s Soccer League. I grew up swimming, biking, and running all the days long as a youth in the New England area and Rob and I would spend time together swimming, biking, and running as fun and healthy outlets to spend time together outside the stressors of our professional lives and to be with friends. This grew to a point where I became and felt more comfortable with the idea of putting all three elements together and felt ready to make a real go of triathlon and put my heart and mind into it. Why Tri? Ever since I saw my very first tri on TV many, many years ago where someone crawled across the finish line, I've been interested but never had the courage to enter one. And then came Team in Training. I had trained for my first 13.1 in 2012 (Arizona Distance Classic) and completed it when they said they were going to be doing a triathlon in San Diego. I had no idea the distance, but I was in since my first experience with TNT was so positive. I figured if nothing else, I would raise money for the Leukemia & Lymphoma Society and finish a triathlon and if I embarrassed myself, I would be out of state and no one I knew would see. I was hooked. I finished my first Olympic distance tri in September 2012. That's why I started. Why I keep doing them is they have pushed me outside my comfort zone. Everyone knows I play volleyball. On a volleyball court, I will not think twice about kicking you when you are down. My competitive nature on the court has actually gotten me uninvited to some teams because I'm "too competitive." Of course, being competitive and willing to push myself usually beyond my physical ability and wanting so desperately to get stronger, faster, leaner, etc., when most women my age (I will be 57 next week) are hanging up their shoes, did garner an invite for the USA 55s team that will be going to Brazil for the World Masters Volleyball Championships. It is not a sure thing but the invite was extended, and I said yes. Waiting to see if I make the final cut. 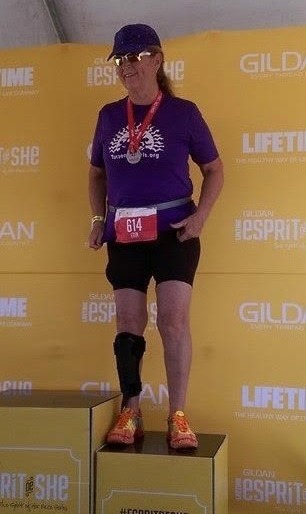 I continue to do triathlon because, I say, I'm fighting old age and gravity every step of the way. I have found something that forces me to step outside my comfort zone and push beyond my limits. And I think that is so very important as we age. It's too easy to say, "I'm too old; I can't do that," or any other such nonsense. Life is short...very short, and I realized that in 2013 when three very good friends of mine all died of different causes at different times throughout the year. It was then that I vowed to continue pushing myself as long as I enjoyed what I was doing because we are not guaranteed tomorrow, and my bucket list is very long so I need to get on it. Doing triathlons keeps me focused on keeping myself in somewhat halfway good physical condition. In addition training for triathlons is making my volleyball game so much better than what it was even five years ago. I always wanted to be involved in some type of sporting activity but other than golf, no opportunity ever presented itself. There were no sports for women when I was younger and we did not even have gym in high school. Though the years, I had some physical issues that eliminated any ideas that I ever had of doing anything physically demanding. I was disabled in the early 90's due to a major back injury and also had hip issues necessitating a replacement in 2003. Than another devastating back injury in 2010 that further hindered my physical abilities. I was looking at buying a walker in 2012 but bought running shoes instead and was also fitted with an ankle foot orthotic that made walking much easier. I made immediate improvements in mobility, did a 5k and wanted more. I was exhausted after that event but couldn't wait to do another one. The sense of accomplishment was overwhelming. On the advise of my son who does triathlons in Chicago, I bought a bike at TriSports which I wasn't able to ride. 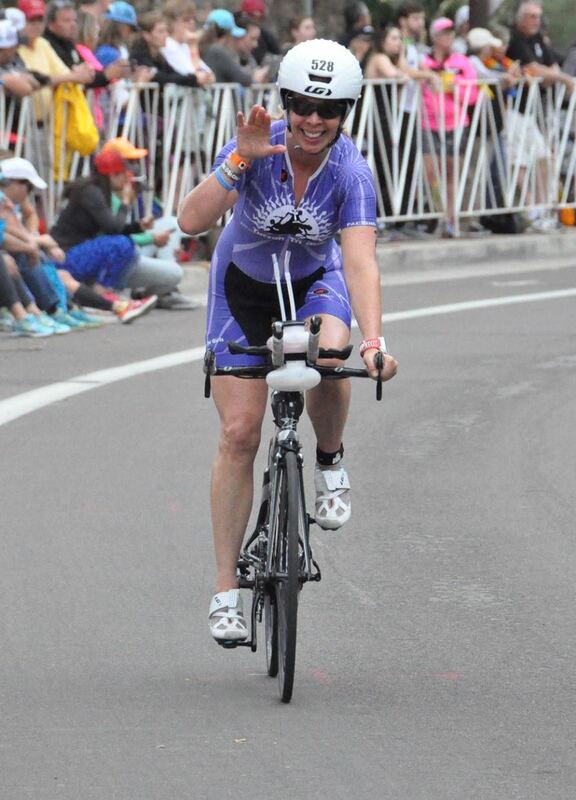 Someone at TriSports suggested I join the Tucson TriGirls because they offered clinics and events for beginners. I joined the next month and there are more activities and events than I can attend. The comraderie and team support is exceptional. It is so exciting and fulfilling to participate and receive all the "way to go" from everyone and know that I will know someone no matter what event I attend. Wow, this never happened with anything else I have ever done. So here I am, a woman who could barely walk, certainly couldn't run, couldn't ride these new fangled bikes and couldn't swim just 3 years ago who had now completed 2 super sprint triathlons and multiple races. I may be slow but I am a TRI GIRL.